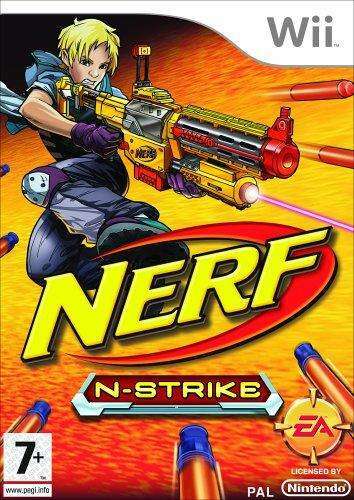 In 2008 Electronic Arts licensed Nerf, the popular children's toys, and created Nerf N Strike Wii. The Nintendo's Wii system was perfect for such a game, allowing players to play with more than 25 genuine Nerf blasters (including blasters such as the Vulcan EBF-25 and Longshot CS-6) in their gameplay . Bundled with this video game is the Switch Shot EX-3 blaster (an external single fire blaster). The Nerf N Strike Wii game is a rail shooter, where players are guided using a third person perspective, and shoot foes as they appear on screen. A total of four persons can possibly go head to head in this multiplayer action game. This however requires additional Wii remotes and SWITCH SHOT EX-3 blasters for the players .